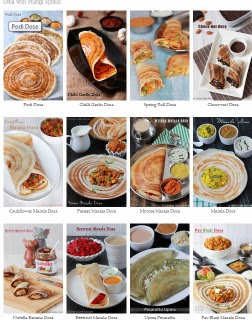 I am often asked by my friends about making kids friendly Recipes. This is a really easy to make dish even if you do not have an oven. People those who does not have oven at home can heat a pan and grease with few drops oil and cook the bread pizza by covering with a lid to cook the topping (veggies and melt the cheese) for 2 minutes. Then open the lid and cook for a minute to get the bread crispy. You can add the veggies of your choice and also brown/whole wheat bread can be used or any bread you get for that instance. Shape of the bread does not matters. You can also use ketchup instead of pizza sauce if you have do not have pizza sauce at home. Apply Ketchup/ tomato sauce/ Pizza sauce in the bread slices. Spread the Mozerella cheese on top of the sauce evenly. Keep the topping as you wish with equal intervals. Don't keep much space in between the veggies, because once you cook the pizza the veggies shrink and fill the space. People those who do not have oven, cook the bread pizza in a heated pan by sprinkling drops of oil and keep the pizza on the pan and cover with a lid and allow to cook for 2 minutes till the cheese melts. Now the bread will be elastic. Then open the lid and cook further 30 seconds to make the bread harder and crispy. People those who have normal heating oven at home just transfer the bread slices into a oven safe plate and microwave for about 1 minute 30 seconds. Now the veggies get cooked and the cheese get melted. Now the bread is elastic and soft to touch. So you wont be able to hold the bread in hand. But If you like you can eat it as such. I always make the base crisp by heating a pan and drizzling some oil on top and transfering the oven cooked pizza into the hot pan. I cook it for 30 seconds to a minute till the bottom of the bread turns golden and slightly crunchy. Now you will be able to hold and handle the bread easily. By doing this step. The pizza turns yummier. Note: Topping is optional you can use Mushroom, Onion, Capsicum, Pineapple, Sweet corn, Jalapeno, Olives for vegetarian options. Chicken sausages, Pepperoni, Cooked Chicken pieces, etc with vegetables are the non vegetarian options. Pizza sauce can be replaced with Tomato sauce/ Ketchup. Any bread Sandwich Bread, Milk Bread,Whole wheat, Brown bread..etc can be used. 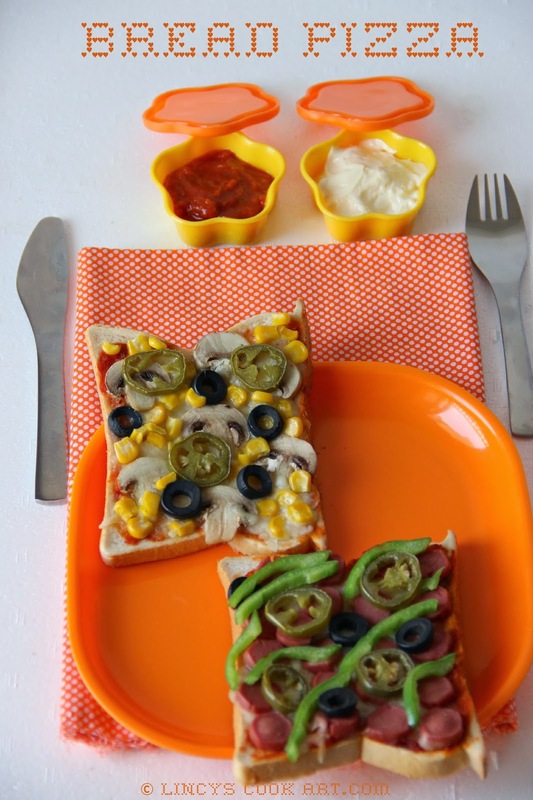 Yummy bread pizza - a kids delight ! yummy pizza..quick & easy...looks delish..
perfect snack for little ones. After having dinner, feeling hungry again by seeing those delightful bread pizzas. Very tempting and inviting dear. Easy and simple. Very nice. Yummy and delicious bread pizza dear ..definitely kids will love this !! Yummy snack... colorful clicks..i liked de last pic so much..
Lincy these bread slices look like butterflies, children will love it. Reminds of a birthday party for which I had baked butter fly shaped bases, wish I had got hold of these slices. Thank so much for visiting my blog.